Rival petitions have been set up over plans for a cycle lane in Edinburgh. Edinburgh City Council has invited consultation at Roseburn Primary school to gauge opinion from local residents, businesses and cyclists, on the proposed West Coates cycle track. The plans include reducing four lanes of traffic from Roseburn to Haymarket to two, and using half a carriageway and a bus lane for cyclists. Supporters say the lanes would provide a safe route into the city centre. 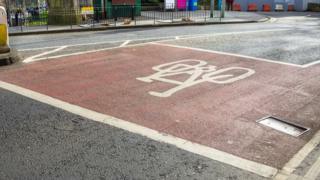 Rival online petitions have been started, both for and against the proposed cycle lanes. Pete Gregson, whose petition opposes the changes, said they would lead to more congestion and claimed shopkeepers at Roseburn feared their businesses would suffer if parking was prevented. "The council's new cycle track will remove parking that allows deliveries to shops. If goods can't be delivered, they can't be sold," he said. "I have road safety concerns too. The track involves removing crossing islands all along the main road. Also compressing four lanes of traffic into two on Roseburn Terrace whilst removing the westbound bus lane would make it harder to cross. "At peak times, traffic is very heavy. If the traffic is jammed up even further in tailbacks we get more pollution." The petition cited National Cycle Route 1 (NCN 1) as an alternative, claiming it offered a quiet route along Balbirnie Place for cyclists travelling to Haymarket, and was a more suitable option, using existing off-road paths and low-traffic streets. Supporters of the changes, however, argued that NCN 1 was less safe as it crossed tram lines and was unlikely to appeal to less-experienced cyclists. Cyclist Henry Whalley said: "We have been trying to get a safer route for people from the west to get into the city centre. "The existing path goes around the houses, it's not so safe, it doesn't encourage people to start cycling." He also disputed the claims surrounding the loss of parking, saying many vehicles were stopping illegally in the bus lane. Edinburgh city council said it was still in full public consultation on the route and was keen to hear the views of all users. The council's transport convener, Councillor Lesley Hinds, said: "I'm somewhat surprised at the protest against a cycle route through Roseburn when we are very much still in the consultation period for proposals and are open to any comments the public would like to make. "These proposals aim to provide a link straight across the city centre, providing a safe and accessible route suitable for cyclists of all abilities. One of our key priorities is to encourage people who are less confident when cycling by providing a segregated, off-road cycle lanes. "We have maintained parking and loading bays near businesses, as well as carrying out traffic modelling to ensure pedestrian safety and minimal congestion. As part of proposals, we will also be making improvements to pedestrian access to benefit people travelling on foot too."